Having had a day or two of proper sunshine this past week, a few of us Veg Patchers did a very English thing and had tea and scones in the garden which was utterly blissful. A little table and some chairs were brought out from the greenhouse and we sat next to the herb patch where many bees were happily collecting nectar or pollen from the flowers. 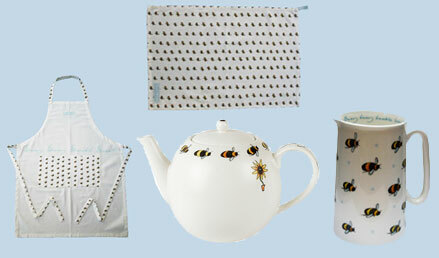 For future moments like this, I'd love to win this Sophie Allport bumblebee teapot and jug, with the tea towel and apron for the washing up afterwards. This is the prize currently being offered in one of the BBC Gardener's World competitions - go here if the thought of owning this kitchenware appeals to you as well. There's also a 15% discount for gardenersworld.com users buying online. If you're more interested in real bees than ceramic ones, Gardener's World has a useful page highlighting the best plants for attracting bees to your garden. It can be found: here. 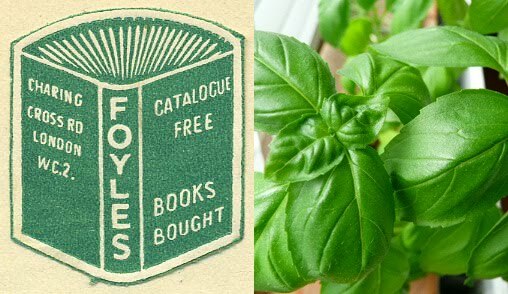 Foyles have recently received the London's Green Corners award from the Conservation Foundation for their Urban Gardening window, and asked Neil from Seed Pantry to put together a little 'round robin' of info for keen beginners to start them off growing veg, salads and herbs. The result was a brilliant evening of top tips served up by Neil, Issy (Fennel & Fern) and Deb (Carrots and Kids). It was well attended and, for me at least, it was a treat to meet Issy and Deb whose blogs I read. (They said they knew of this blog but I think perhaps they made that up, y'know, just to console me.) Meeting them made me think how lovely it would be to get together with other bloggers and have a chat over a decent cup of coffee … but, hey ho, we all have busy lives. Now, I know you'll be interested to hear some of the Good Ideas which were shared yesterday - I forgot to take a pen as I left the house in a mad, scatterbrained dash, so this is a bit of what lodged in my head. Coffee grounds: gritty texture disliked by slugs - use as a mulch around beans, cabbages, etc; it will not harm the plants and is good for the soil. Also, add to your compost heap to speed things up. Tomatoes: Soak tomato seeds overnight before sowing as this helps germination. Pot on when roots can be seen coming through drainage holes. When about 12 inches high, pinch out the side shoots to keep the growing energy in the central stem and repot shoots straight into compost. Water twice a day for a week (tomatoes grow new roots from their stems, who knew?) and give new tomato plants to less green-fingered friends. Tomato Blight: Ah, yes. The Big One. Issy recommends spacing them well apart, leaving a corridor of air between plants. Blight is an airborne fungus that loves a bit of humidity so keep things fresh and dry. Don't get your tomato leaves wet when watering (rainfall is okay as it can't be helped). Cut off the lower leaves when the plant has set fruit - this also helps deter blight. Basil: is an annual herb, need to resow every year. Will happily grow from seed. 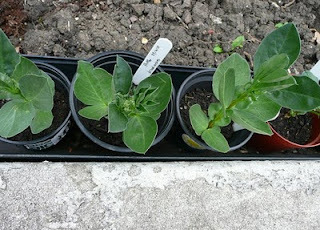 Sow seed into pots every few weeks to have a continuous supply on your windowsill. Likes an open window for fresh air. (I never knew this before but, I guess, you know it makes sense.) Water when top soil is dry. Chives: Those big pom-pom flowers not only visually pretty up a salad but can be eaten, which sounds … um… interesting. 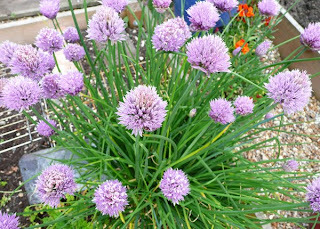 Chives sown from seed this year will be big enough to eat next year. May keep going year on year if you shear off the top in the Autumn. Can keep using even after flowering. Storing herbs: 1) Freeze into ice-cubes; surprisingly, this includes basil. 2) Pick leaves and dry in microwave. Experiment with timing - a minute or two should be enough. Not Sage though, it may catch fire! 3) Pick a bunch, tie with string, hang upside down to dry. So there we have it. I'll add more if anything else bubbles up through the fog of my thinking. 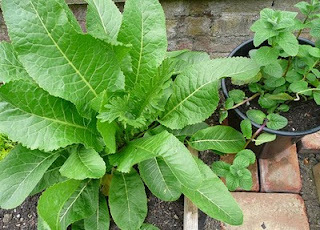 I'll leave you with a Fabulous Friday pic of a herb that didn't get mentioned yesterday but of which I'm inordinately proud because it seems to be doing so well: my horseradish (dig up in autumn, leaving bit of root in ground and will grow again next year). I'd love to know if you have a plant that makes you smile when you see it! Have a lovely weekend -- wishing everyone good gardening weather! I'm not normally pessimistic but I confess I have been a bit disheartened of late. I've been invaded. 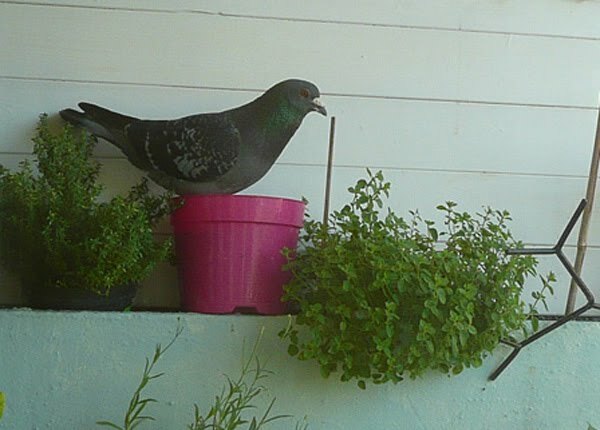 Yes, just a few days away from home over half term and a family of pigeons have moved in, taking over my balcony, behaving like rock stars and trashing the place (seedlings completely squashed or broken). All very distressing. My kitchen now looks like a horticultural hospital as I've started again, this time indoors, and am also hoping that the poor oppressed cauliflowers, courgettes, squashes and nasturtiums will recover. I've had one raised bed ready for planting for a couple of weeks but have been diverted off from this task by putting in another brick path and digging over a bed for my french beans (Blue Lake from Dig In, doing nicely), putting up a little support frame for them and inter-planting them with strawberries. The little reclaimed brick paths between the beds hit the to-do-list last year when the kids and I tramped home with a couple of inches of veg patch clay-mud attached to the bottom of our shoes. I'm planning (eventually) to put them in around all the beds, just loose laid so that I can lift and plant in the space if needed. Suddenly though, everything is a priority: seeds lately sown (literally), sweet peas to transplant (the coppiced hazel branches for the wigwam have already been delivered by a friend), weeding to be done (that one crept up rather fast!) 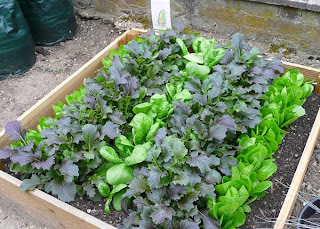 and lettuces/beetroot/carrots/spinach to be thinned out. Oh, and a blog to write. 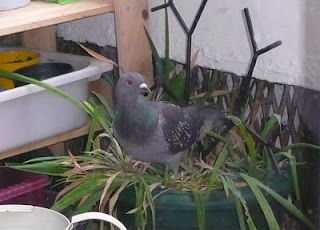 … And pigeons to be dealt with (a losing battle so far). 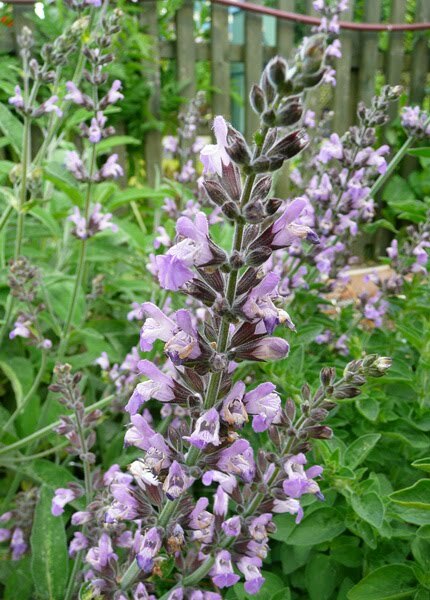 I've recently applied for funding to extend the Patch with some railway-sleeper beds which I hope to fill with sensory plants and edible herbs and flowers as a Children's Garden. I've had to draw a rough sketch to show where the planters will be and it's made me realise how small the Veg Patch is. I take my hat off to those of you who have huge allotments to fill and control, although (perversely) maybe it's easier if you have lots of space to fill? I've had to take out the Kale (really only any good now for my neighbour's rabbits) to make room for … what? radishes? sweetcorn? leeks? 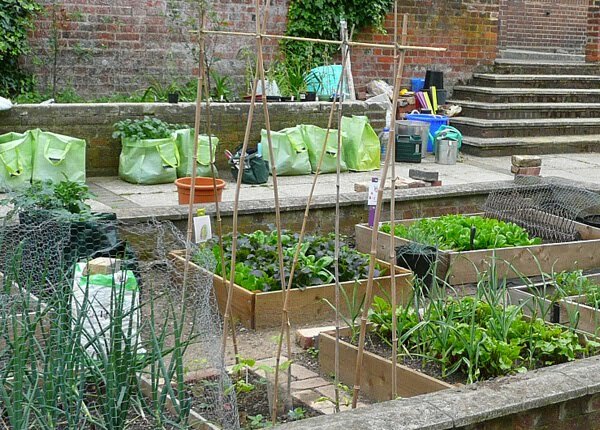 Where will the pumpkins, courgettes and squashes go? What about the tomato bushes, cauliflowers, nasturtiums, calendula and herbs? Oh, never fear, I will fit it all in - but I may have to stop and dig out another bed beforehand!